With Valentine's Day only being a week away, it's a crucial time to figure out what to get your favorite fishing partner. Here are ten YakAttack essentials to help get you started. Made from our aluminum Top Loading GT90 GearTrac™, this bottle opener is super heavy duty, efficient, and built for the job. The Get Hooked Logo Tow Flag is a necessity in most states since it's required to attach a red flag to anything that extends a few feet past the bumper of your vehicle - including kayaks. Show you’re a loyal YakAttack customer while fulfilling state laws. The CatchNRelease™ Drip Rings are the driest drip rings on the market thanks to their deep-dish design that catches water while in the high position, and deposits back into the water during your downstroke. Soft and supple, these drip rings are easy to install and are compatible with all common-sized paddle shafts including Werner Paddles, Bending Branches, and other popular brands of kayak paddles. Sold as a two pack. This product is a must-have for kayak anglers and recreational paddlers alike! This soft rubber scupper plug is designed to fit circular scuppers for sit-on-top kayaks. With two options to choose from (1.13”-1.40” and 1.35”-1.70” diameters) we have something for everyone. The rigid center core gives you a nice place to push the plug in place, while the pull tab allows for easy removal. The MightyMount Switch™ features a four-hole pattern identical to old-school mounts that allows you to switch out your out-of-date accessories for more modern track-mount accessories without the need to drill extra holes. Compatible with the LockNLoad™ Mounting System featured on the Omega™ rod holder, YakAttack fishfinder mounts, and the new Zooka II™ rod holder, as well as with other MightyBolt™ accessories. The RotoGrip™ paddle holder has revolutionized the world of paddle management. Compatible with YakAttack MightyMounts™, GearTrac™, and most other kayak track systems, this handy little gadget is super easy to use and has lots of options for installing and configuring to meet your unique needs. To use, simply press the paddle shaft between the two soft rollers. The paddle is now secure between the low-profile rollers, which retain it with the perfect amount of tension. Voted Product of the Year in the 2016 Kayak Anglers Choice Awards, the RotoGrip™ is a must-have for kayak anglers and recreational paddlers alike! The new MightyMount II™ is an improvement on our original MightyMount™, a low-profile, highly-versatile mount with a small footprint of just 2”x2.375”. 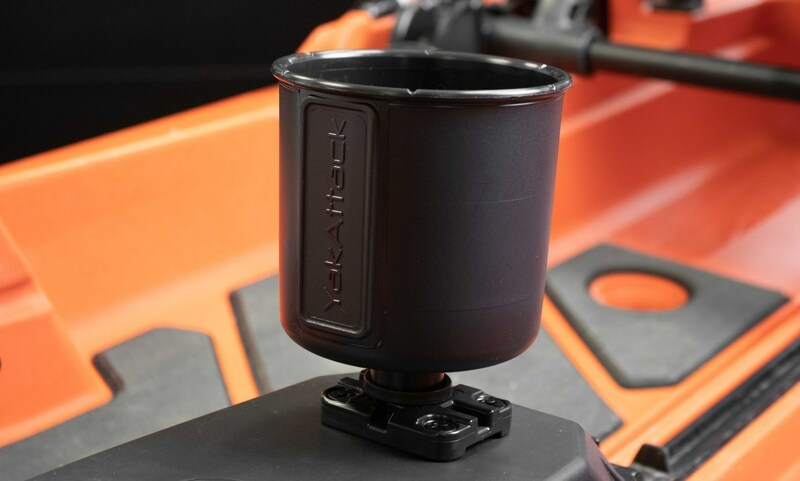 For use with accessories requiring a single t-bolt attachment point or with YakAttack products that feature the LockNLoad™ Mounting System such as the RotoGrip™, MultiMount Cup Holder (shown below), GT Cleat, or our series of rod holders. Since the MightyMount II™ has an identical hole pattern to the original MightyMount™, it can be easily switched out and upgraded without the need to drill more holes. If you want something just as low-profile as the MightyMount II, but with a bit of a bigger profile, let us introduce you to the MightyMount XL track system. Incredibly affordable, this track system ranges from 6” to 12” and is injection-molded from high-quality materials designed to withstand harsh marine conditions and medium to heavy duty applications. Similar in function to our GearTrac™, this track system allows you to install t-bolt accessories from either end. A simple twist allows quick and easy position adjustment, but a few extra turns are required to remove the accessory, giving the MightyMount XL™ the same gear security features of the original MightyMount™ with all of the adjustability of GearTrac™. Compatible with all YakAttack track-mounted accessories, this track also features a textured upper surface for added grip while making it one of the best-looking mounts on the market. The YakAttack GT Cleat is a simple and highly-effective solution to the question of line management. A perfect companion for our Anchor Trolley (not shown), this is low-profile and easy to attach or adjust anchor line cleat. The underside of the cleat features a rubber washer and two tabs to prevent it from rotating and sliding around on the track. Compatible with up to 3/8” line. An authentic, seamless Hoo-Rag® that allows you to show the world that you’re a loyal YakAttack customer. It can be worn as face mask, neck gator, neckerchief, headband, balaclava, hairband, and several other ways. It offers up to 30 UPF sun protection and is 100% moisture wicking, allowing you to stay cool, dry, and protected in the summer months. Approximately 20”x 9.5”. One size fits most.